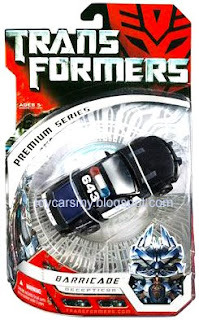 New Transformers Premium series has arrived at ToysRus. The famous Decepticon Barricade was finished within 2 hours. Together with this order there are few variance colour of Bumblebee Camero. Each of them are selling at RM49.90. Wow! very good business here. Should join nuffnang & adverlets..
Can make money... Good Luck! Eh,why dont you design another T-shirt with your collection as feature? Company got enough $$ to do or not? ?